This is a charming way to symbolize twin or multiple losses. 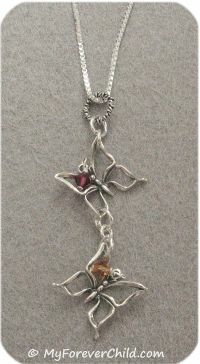 Sterling Silver and Swarovski Crystal birthstone butterflies look like they're in flight one underneath the other. Select how many butterflies you desire below, and write in the crystal color choice in the box. Each butterfly measures 7/8 inch end-to-end. You can select up to 3 butterflies in the pendant. Comes with a sterling silver box chain, select length below.